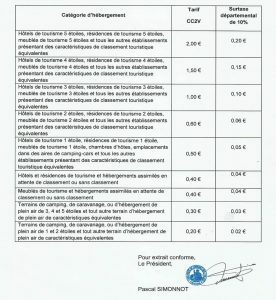 The Tourist tax has been set up on the 15 cities of the Communauté de communes des Deux Vallées, on february the 23rd 2016, These 15 cities are: Boigneville, Boutigny-sur-Essonne, Buno-Bonnevaux, Courances, Courdimanche-sur-Essonne, Dannemois, Gironville-sur-Essonne, Maisse, Milly-la-Forêt, Moigny-sur-Ecole, Mondeville, Oncy-sur-Ecole, Prunay-sur-Essonne, Soisy-sur-Ecole et Videlles. According to the article L.2333-29 of the General Code of the Territorial Collectivities, the tourist tax is due by people hosted against payment, who do not live in the city, and who do not own a house in the city for which they are due to pay a housing tax . Since January 1st 2018, the departments have set up an additional tourist tax, which amount is 10% of the collectivity tax.